Kirby's Left Eye: Hardy's Gone; and Tsuyoshi.... ? Hardy's Gone; and Tsuyoshi.... ? This morning it was announced that the Twins traded shortstop JJ Hardy and Brendan Harris to the Orioles for two pitching prospects. Predictably, Twins fans on the internet started freaking out—you know, because the Twins’ front office changed something. If you’re a loyal reader of my blog (if those actually exist), you might have picked up by now that I don’t pretend to sit here and know more about how to run the team than the professionals. Do I agree with every single move? No. But do I trust that the people who actual have contact with the players, the accounting books, and the agents are probably able to make much better and more realistic decisions than I am? Yes. You can’t change the lineup without actually changing the lineup. Change is good. You can’t make significant gains without taking some significant risks. This is a part of baseball. This is a part of life. LETS GO! SPEED STAR! TSUYOSHI NISHIOKA! We all know this must be immanent. Can't we just be excited!?! TSUYOSHI! SPEED STAR! 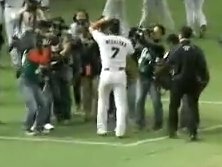 TSUYOSHI NISHIOKA! It's like the bizarro Metrodome. It's like he's using the Mauer Quick Swing! This has nothing to do with your topic, but I mentioned in my Subway Squawkers blog today that you were right about Joe Mauer and that whole deer-hunting thing. I heard Cliff Lee is a deer hunter, too, which doesn't bode well for the Yankees! Very nice. I didn't even know there were deer in Texas! I CALLED NISHIOKA AS #1!!! Huh? Why Didn't They Have Twins Fest at MOA?